CF® dye goat anti-mouse IgG1 isotype-specific secondary antibody conjugates are labeled with our exceptionally bright, photostable CF® dyes. The conjugates are prepared from affinity-purified antibodies that react with Fc portion of the heavy chain of mouse IgG1. 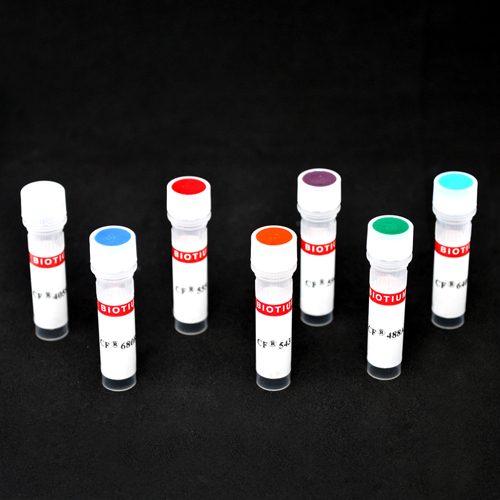 CF® dye goat anti-mouse IgG1 isotype-specific secondary antibody conjugates are labeled with our exceptionally bright, photostable CF® dyes and other labels. The conjugates are prepared from affinity-purified antibodies that react with Fc portion of the heavy chain of mouse IgG1. To minimize cross reactivity, the antibodies are cross-adsorbed against other mouse IgG subclasses (IgG2a, IgG2b, IgG3), and human, bovine and rabbit serum proteins. CF® dyes offer exceptional brightness and photostability. See the CF® Dye Brochure for more information. Note: Conjugates of blue fluorescent dyes like CF®350 and CF®405S are not recommended for detecting low abundance targets, because blue dyes have lower fluorescence and can give higher non-specific background than other dye colors.